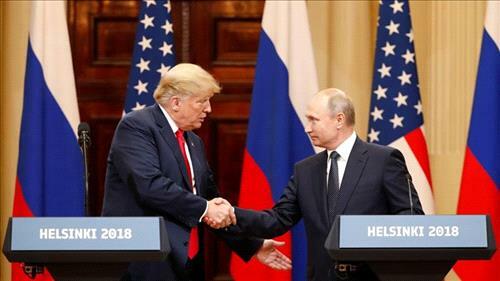 AMMONNEWS - President Vladimir Putin and his US counterpart Donald Trump have committed to improving relations between the United States and Russia, with Putin saying there was no longer any reason for tensions between the superpowers. "There are no objective reasons for difficulties [between Russia and the US]. The Cold War is a thing of the past, the situation in the world has drastically changed," said Putin. Earlier, Trump blamed his own country's past "foolishness and stupidity" for the two powers' hostile relations. At a press conference following the summit, Trump praised their "direct, open and deeply productive dialogue" and emphasised the need for continued diplomacy over confrontation. "A productive dialogue is not only good for the United States and good for Russia, but it is good for the world," he said. "Our relationship has never been worse than it is now, however that changed as of about four hours ago... To refuse to engage would not accomplish anything." "As major nuclear powers, we bear special responsibility for maintaining international security," he said. Putin said the US and Russia could collaborate to "establish peace and reconciliation" in Syria, with Trump adding by working together to end the conflict, the US and Russia could "save hundreds of thousands of lives". The two leaders also committed to securing Israel's border with Syria in accordance with the 1974 Agreement on Disengagement between Israel and Syria. During the conference, Putin reiterated his denial of alleged Russian meddling in the 2016 US presidential elections. "The Russian state has never interfered and is not going to interfere in internal US affairs," he said. For his part, Trump criticised the ongoing US investigation into the allegations as a "disaster". "If they had [evidence], it would have been out long ago," he said. Many US critics had called for the summit's cancellation after new revelations surrounding the alleged election meddling. "I was an intelligence officer myself and know how these dossiers are put together," said Putin. While acknowledging there were still challenges ahead in improving relations between the two countries Putin said he was "glad" at the outcome of Monday's talks. "We were not able to clear all the backlog, but I think we made a first important step in this direction," he said. Putin told Trump at the start of their summit on Monday "the time has come to talk thoroughly about bilateral relations, as well as various hotspots in the world". Key members of the US Congress, including some Republicans, criticised Trump's comments. Senator John McCain called the press conference "one of the most disgraceful performances by an American president in memory". The Arizona Republican said the summit with Putin in Helsinki was "a tragic mistake", adding Trump made a "conscious choice to defend a tyrant". House Speaker Paul Ryan delivered a strongly worded statement saying there's "no question" that Russia interfered in the 2016 presidential election. "The president must appreciate that Russia is not our ally," Ryan said, adding Moscow "remains hostile to our most basic values and ideals". "I never thought I would see the day when our American president would stand on the stage with the Russian president and place blame on the United States for Russian aggression," tweeted Senator Jeff Flake. "This is shameful."